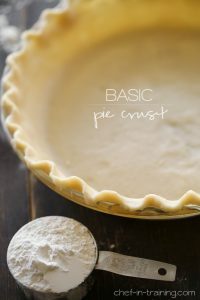 We all have those family recipes that are handed down to us from our grandmas or even their grandmas :) As I was thinking about my blog, I realized that I had never shared my grandma’s recipe for pie crust. Mainly because I am not a huge pie person. But that doesn’t mean my readers aren’t pie people and I surely can’t deprive you of this great recipe. Just because I am not a pie person, doesn’t mean this recipe or any pie recipes I post aren’t delicious, because they are. It just means that if there was a piece of pie or a chocolate dessert in front of me, I will go for the chocolate purely out of preference. My grandma on the other hand, is a pie person for sure and this is her crust recipe that has been handed down to my mom and now to me. It is so easy to make and tastes delicious! For part of my graduation gift, along with the her big cookbooks, she gave me plastic pie crust bags for perfectly round pie crusts and a pie crust edge protector to keep the edges from burning. So I decided to put them to use :) So here you have our family’s favorite pie crust recipe. This Pie Curst is so easy and tastes so good! Combine flour, salt and sugar in a medium bowl. Cut in the butter with a fork until mixture is crumbly. Add cold water, starting with ¼ cup, adding a little at a time, until perfect consistency is reached. Separate dough in half for two pies, or one top and one bottom for one pie. Roll out and place in pie pan. Flute edges. Poke holes in the bottom of crust prior to baking. Bake at 425 degrees F for 15 minutes. This baking time is just for the crust, not a filled pie. However, the crust can be used for a filled by, the baking time will vary for each recipe. For a filled pie, do not poke holes in the crust. How much salt?? Not listed in ingredients? What exactly is perfect consistency? My thought too! I tend to make mine quite damp, put on floured surface and you can feel the consistancy with your hands as you work it on the floured surface. I used to have an awful time with crust trying to follow a recipe. Putting a sticky pile on a floured board has really helped me. Can you fill this crust before you bake it or do you have to bake it first? yes, you can fill it before you bake it. sorry for the confusion :) The baking time will just vary for a filled pie recipe. You cook the pie crust for 15 mins then add your pie fillings? you can fill it before you bake it. sorry for the confusion :) The baking time will just vary for each filled pie recipe. The baking time listed is if you are baking just the crust. I have updated the recipe to say so. Love your take on several recipes I've read! But I've had that recipe for years and just didn't have the touch. My family was always warned before eating their piece of pie, I was not sure if the crust turned out to be cardboard or glue! Lol! Keep those recipes coming! .p.s. Adding vodka (1/2 water, 1/2 vodka) works and chilling for 25 minutes once rolled out and in the pie plate works too! I have never used that much water in pie crust before. A tablespoons maybe. Also only fill the pie crust before baking for certain pies. Pies like banana cream, or chocolate, you want to bake the crust first. Make sure to poke holes in the bottom first too, or it will bubble. I am surprised there is no shortening. The butter is the shortening. 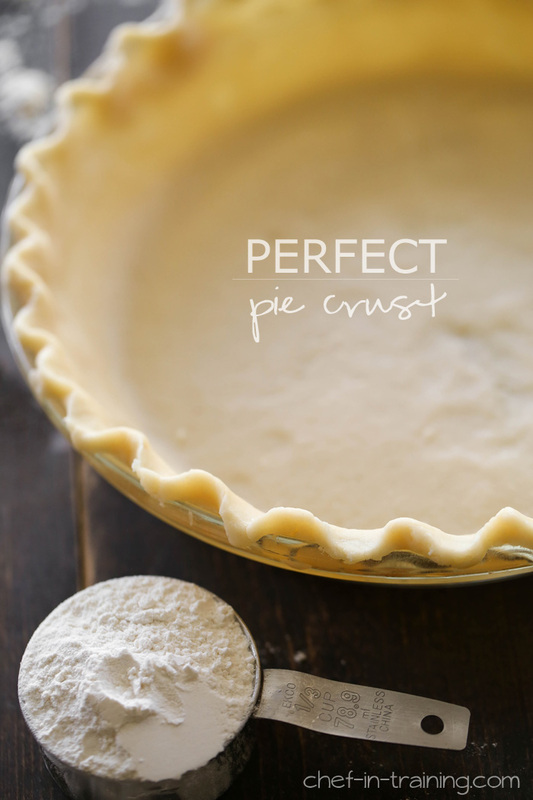 I've always made my own pie crust but this one sounds even better. Can't wait to try. Thanks for this. I just tried this yesterday and something seemed off -- the dough was incredibly difficult to work with and had no integrity. I know I typically freeze the dough prior to use. Would that have helped? too much water in her recipe. Start with tablespoons, and make sure ALL of your ingredients are COLD when making any crust. I suppose you could just as easily make this in a food processor. But what about resting time in the fridge? Just use the Crisco recipe, but substitute 1/2 the shortening with butter. My 97 year old grandmother used that recipe forever. The instructions here are not clear at all. When making a filled pie, such as pumpkin or fruit, brush your crust with an egg wash to prevent a soggy crust, and refer to your pie recipe for baking times. Would I be able to use this as a pot pie crust as well? I really wanted to like this recipe because it looks perfect on the picture and seems easy enough. I think I will go back to my recipe that needs chilling before rolling. Sorry grandma, but this is not the crust for me. Fell apart on me and looks like my two year old daughter made the pie. This came at the perfect time! I've just moved to Europe and can't find lard to make my pie crust recipe. I can't wait to try this, thanks for sharing! Oh my goodness, my grandma Macie's recipe is your grandmother's! My grandma lived in Iowa on a farm.....made the best pies, thank goodness she gave me all her recipes! where do you get the thing to protect the crust edges while baking? I've made these crusts several times now and it is my go to recipe! I love it!! And my family does too. I saw there are some questions on perfect consistency... I mix mine until i can easily roll the dough into a ball without it being super wet. I usually put 2 ice cubes into a wet measuring cup and fill up to 1/2 cup with cold water and I use most if not all of the water. Thanks for the great recipe and Happy Thanksgiving! What brand of flour the best flour to be use in making pastries pie?? How will you know when you're dough is the perfect consistency ? I don't want to add too much or too little water . Or make the dough to dry . Because I have had previous problems with my dough cracking , being to dry before. Do you chill your crust before rolling it out? Have you ever tried the recipe with the vinegar and egg. That is the best pie crust you will ever have. Try it. I have decided to put bake a pie from scratch on my bucket list since I have never done it in all my 60+ years. I have a couple questions? How does one "flute" a pie crust? And .... Aren't all pies filled ones? (Re: "don't poke holes in the bottom crust of filled pies") And I thought of another....Do you have to add flour to roll out like a biscuit or just plain between plastic wrap? Hi, how thick should the crust be rolled out? Loved this pie crust. I used it to make hand pies and they turned out great! Thanks for the recipe!